This course will cover the topics normally covered in a middle school prealgebra course. This course is normally taken by students in grade seven or eight, and is designed to prepare students for Algebra 1. A detailed course outline is shown below. The complete content of the course is in the lecture videos and the Student Workbook. The textbook is no longer necessary. 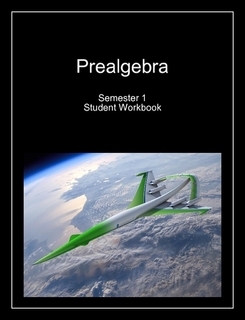 This course originally used Prealgebra, An Integrated Equations Approach by Donald Hutchison, published by McGraw Hill, for homework and practice problems. Complete sets of problems, along with full solutions, are now included in the Student Workbook. Students will be given specific assignments to complete each week. Assignments will consist of study and practice from the textbook, instructional videos online, and written assignments. In this class there is a distinction between Practice Problems and Homework Problems. Practice problems are assigned in the textbook and in the workbook, and students check their answers with the solutions provided. Homework assignments and tests are printed from the website, completed, and turned in for a grade. These topics comprise the material normally taught in a prealgebra course.